It is week 17 in the review of the CRM Field Guide chapters from the book – The CRM Field Guide – How to CRM Like an MVP with Microsoft Dynamics CRM. This week it is the 46 page CRM Server Optimization, Maintenance and Monitoring chapter. This chapter takes off where Chapter 2 CRM Server Installing and Configuring ends. While the installation process is pretty much point and click, it doesn’t do much for optimizing the settings in Windows Server or SQL Server for your environment. If you are a System Admin or Network Admin and have CRM 2011 running in your company, this chapter is a must read. There is more information packed into this chapter than you can get from 8+ hours of CRM consulting time. In fact at our firm we regularly refer to the tips, suggestions, tricks, and insight provided by the author as we do work for our clients. One area that is often overlooked is managing which folder paths are inspected by the server anti-virus software. 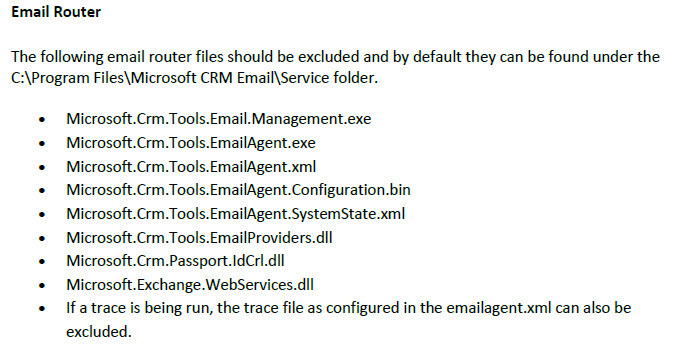 The author provides a listing of all the folders and file types that are used in the CRM environment to give you a comprehensive exclusion list. And if you aren’t a SQL guru there are a lot of tips on how to optimize SQL for the CRM environment.